Saturday, July 30, 2005. 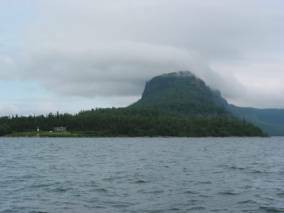 Tee Harbour, in the shadow of the Sleeping Giant (again). This morning it was raining (finally). 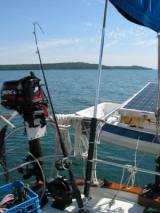 We left Thunder Bay in the rain right at the beginning of a sailboat race from Thunder Bay to Houghton, Michigan. This is an annual competition. 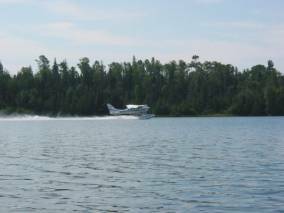 Seven boats had sailed to Thunder Bay from across the lake and another 6-8 boats from Thunder Bay were racing. 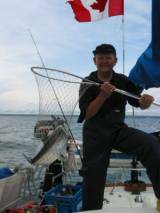 When we were north of the Welcome Islands, Brian caught a 10 lb. Chinook salmon on the line. He managed to reel it in, but it took the two of us to get it in the net and land it on the boat. 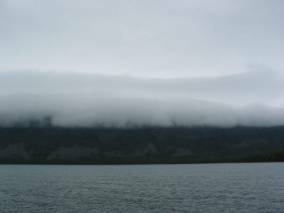 As we came into the harbour, the rain had stopped, but there was low cloud over the giant, and seemed to be dripping down his sides. We almost expected to see Moses and hear God out of the cloud. Brian got some pictures, but they will not do justice to the impact of being here. 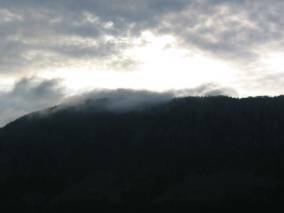 By 11:00 the rain had stopped, but the Sleeping giant was totally encased in fog; there was no evidence of any towering cliffs above us. It was disorienting, knowing the cliffs were there but not being able to see them. Sunday, July 31, 2005. Ariel Island / Edward Island. 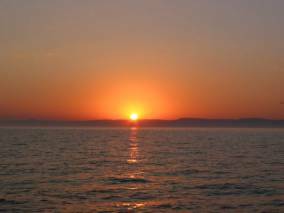 Once we were out of the anchorage, we could feel the residual swells from the southeast. No white caps, but the sea was running about 2 feet high. 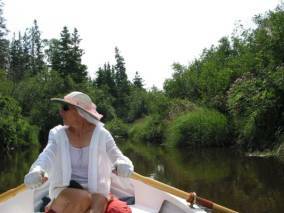 There was virtually no wind, so we motored toward Edward Island. 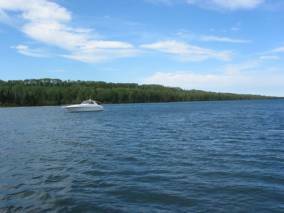 We had planned to stay at Edward Island Harbour, a bay on the southwest end of the island. This was not the best, since the wind had picked up to about 10 knots from the southwest, but we went in. We were still in 40 feet of water less than ¼ mile from shore. We finally got into 20 feet of water, fairly close to shore, and dropped the anchor. We were not able to get a good set. Brian said it felt like solid rock (chatter, chatter, chatter) … so we tried anchoring a bit further out the bay. This time we seemed to catch, but we seemed to be drifting. We decided this was not the right anchorage for us, so we hauled the anchor up. Some mud and several large branches came up with the anchor. We decided to go to the NW anchorage because the forecast was for continued SW winds and this is protected from all but North and Northeast winds. The wind had picked up to about 10 knots, so we unfurled the Genoa. 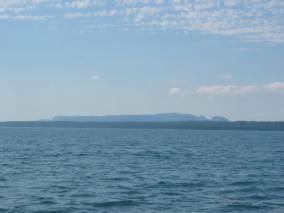 We sailed / trolled up the channel between Edward and Grey Islands. No bites … but we saw 4 loons and lots of small fish on the fishfinder close to the surface. 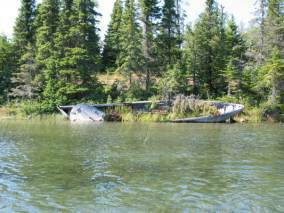 Once anchored, in 15 feet, I hoped for warmer water. It is 60 degrees F., still too cool for me, so our showers were inboard today. There is a slight breeze from the SW, but the forecast has been changed to NE winds overnight. We feel we have a solid anchor down, so we are not moving. Monday, August 1, 2005. 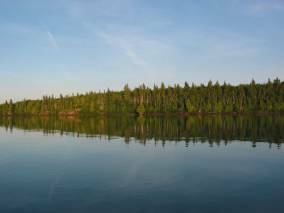 Tobin Harbor, Isle Royale. OK, we changed our minds. When we looked at our schedule, including weather days, and realized we were as close to Isle Royale at last night’s anchorage as we could be, we decided to move over to the USA. There was no wind today, so we were neither aided or hindered by wind. We were a bit surprised that there was still a 1 foot surge left over from Saturday’s SE winds. 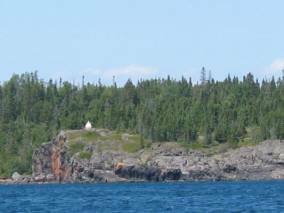 We motored all the way from Edward Island to Blake Point, the Northeastern most tip of Isle Royale. We continued motoring down the channel to Rock Harbor where there is a ranger station. 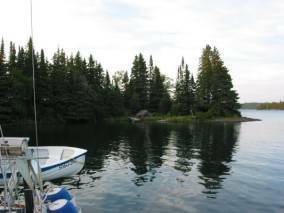 Since Isle Royale is a national park in the US, we had to register with a sail plan and pay $8.00 per day (includes half days!) and fill out some paperwork. Then we had to clear park immigration and customs (they only clear Canadians in for the Isle, not the US in general …. The plan we filed has us in Tobin Harbor (mainly because the fishing is supposed to be the best in this area. 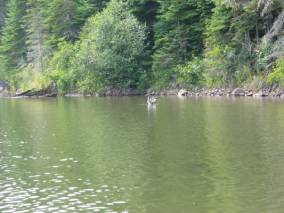 So far, we are sharing a harbour with a couple of very large loons, but Brian has gotten no takers to his lures.) We are currently anchored mid-way down the bay. When we arrived in Tobin Bay we tried anchoring near the mouth of the bay. 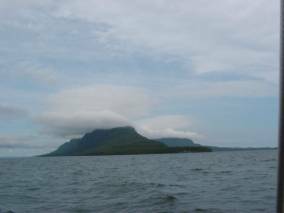 We had been warned by Bonnie Dahl that this anchorage was difficult because the bottom was solid rock. We tried 3 times to set an anchor and then gave up. 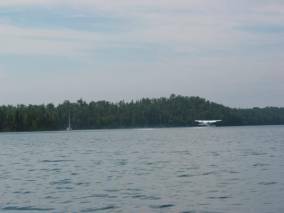 WE moved about halfway down the bay, past the floatplane take-off and landing area and got a good anchor bit. There is absolutely NO wind… the water is like glass. 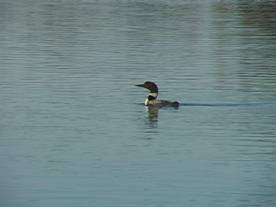 We have enjoyed watching the very large resident loon chase a family of 4 Mergansers (diving ducks), but have not seen any moose or wolves yet (for which the park is famous). Now that we are in the US, if you go to our website (www.pilgrimsprogress.com) and click on the icon that gives our position, you may be able to pull up an aerial photograph of our anchorage. If you cannot get that, you should at least be able to get a map showing our position and can zoom in on different levels of detail. In Tobin Bay I think I mentioned that the Loons were BIG. They were also numerous and noisy. At one point we saw at least 7 of them in a group diving. In the evenings and in the middle of the night, they would call to each other in flight. 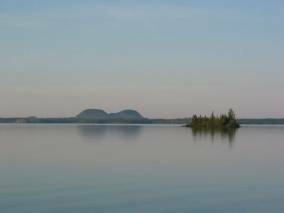 The Isle Royale newspaper indicates that this is the only locale on the Great Lakes that has breeding loons (which I am pretty sure is not correct … perhaps in US waters), but there surely are many of them, they are big and are relatively tame. 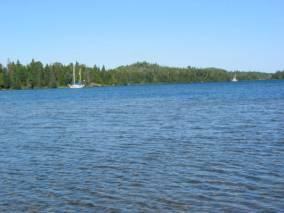 When we got to the SW tip of Tobin Harbor, we anchored in about 12 feet of water (where the Great Lakes Cruising Club indicated there should be 20 feet!) We went out in the dinghy and trolled and took soundings. We now have major revisions to submit to the GLCC regarding this harbour. 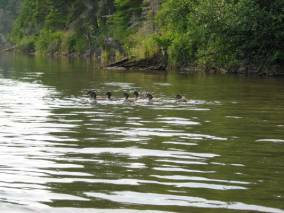 While we were rowing, we saw a family of 7 chicks and one mother ring-neck (diving) ducks. 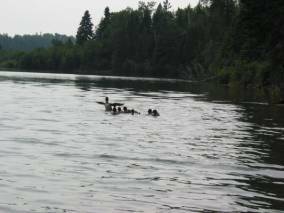 We just drifted down on them and they continued with their diving lessons. We actually got close enough to see them underwater. They are really fun to watch. They dip their heads into the water, look around, and as soon as they see something interesting, the do a most delicate little dive. The wind increased to 20 knots from the west as we left Tobin Harbor and moved into Rock Harbor. 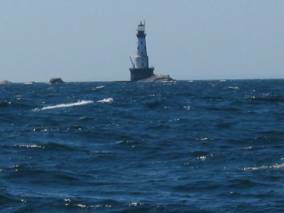 We motored into the wind about 4 miles down Rock Harbor to Caribou Island, an anchorage recommended by Bonnie Dahl. 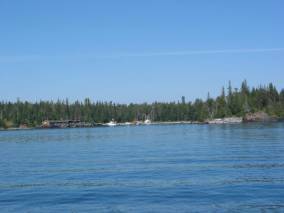 When we found the small island next to Caribou that we were supposed to tuck into, we could see shoals coming out in two directions. 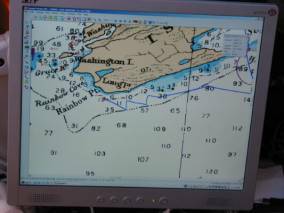 There was no detailed diagram or chart of the area, and with the strong winds, we decided to bypass Caribou and proceed on to Chippewa Harbor. We passed through a narrow channel (Middle Island Passage) and since we were going West Southwest, and the wind was from the Northwest, we hoisted the mizzen and unfurled the Genoa. We had a wild ride, with a top speed of 7.7 and gusts up to 22 knots. Thursday, August 4, 2005. 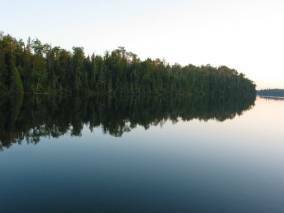 Chippewa Harbor, Isle Royale. We stayed 3 nights in Tobin Bay, and have now moved to Chippewa Harbor. We made our way into Chippewa Harbor at 3:00. We checked out possible anchorages, and finally decided to anchor in a spot not recommended by GLCC or Bonnie Dahl. 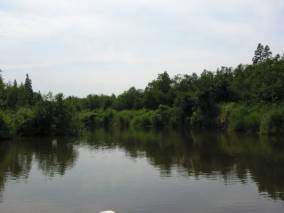 After we were securely anchored, we explored in the dinghy and discovered that the recommended anchorage went from 30 feet to 5 feet at the mouth a creek. 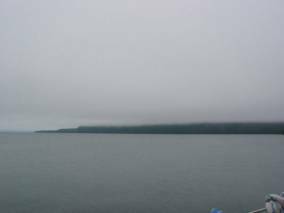 On Friday we sailed from Chippewa Harbor to Hay Bay, located in the mid-South-west area of a very large bay, Siskiwit Bay. It was a relatively short sail with strong southwest winds (we were going southwest, of course). 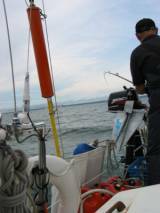 We did a combination of motor-sailing and sailing. Hay Bay is supposed to be a good anchorage, because there are no trails that lead to the bay for backpackers (we are not sure when backpackers became the “bad guys”). We arrived in Hay Bay around 3:30 PM and first attempted to anchor in 12 feet outside the “inner” bay. We hit bedrock. No possibility of any anchor holding. We ventured inside the inner bay and the depth sounder registered anything from 10 feet to 4 feet! 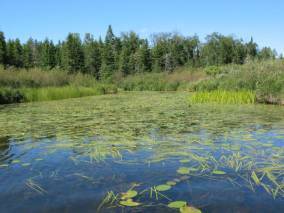 The bottom was covered with weed growing to within a foot of the surface. We tried to set the CQR without any luck. Then Brian took our 20 lb. Danforth to the bow and deployed it. It seemed to set OK in 20 knots of wind. We closed down everything for the evening, put the main cover on the sail, etc. etc. Within 30 minutes we were dragging … 90 degrees to the wind. We retrieved the anchor and tried to position ourselves in another location, keeping the three power boats locations in mind and reset the anchor. By the way, when we brought up the Danforth, there was a large branch in its jaws. The branch is what was holding us, and we are glad we did not discover that after dark. Just as we set our Danforth the second time (and it really bit in this time), one of the power boats broke loose and went drifting down the bay. They decided to go for the park dock and with a great deal of difficulty, docked themselves. Now there were just two power boats and us at anchor. We were really happy to have the second attempt at anchoring with the Danforth hold, because there was another drama going on we wanted to observe. 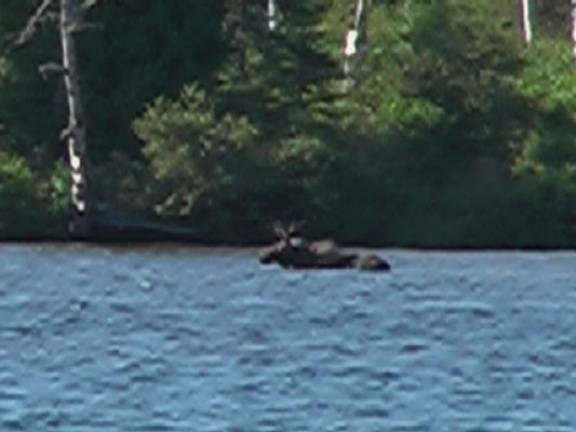 There was a large male Moose wading in the water up to its neck, dipping its head into the water, bringing up weed roots, and shaking its head vigorously, sending spray in all directions. Quite fascinating to watch and photograph. Later on we saw the female and a calf in the shallower water at the head of the bay doing the same thing. The moose made the anchorage worthwhile. It was otherwise just a safe place to spend the night. Today we headed out at 9:00 because the trip to Washington Harbor (as the crow files) is 30 miles and we had to tack through 10 – 18 knot southwest winds again. We did some motor-sailing and ended the day with a great sail with reefed main and full Genoa in 15 – 19 knots of wind. Saturday, August 06, 2005. 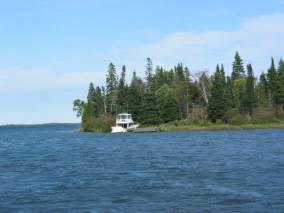 Johns (or Johnson) Island, Isle Royale. We decided to anchor in Johns Island because it is a deep cove running Southwest to Northeast and we still have fairly strong SW winds. The cove is much more cozy than we expected (there is little swing room if the wind shifts direction, but the forecast is for more SW winds for the next three days). We anchored in 22 feet of water, let out 40 feet of chain and snubbed the anchor, giving us a total of 60 feet of rode … not your comfortable 5:1 ratio for chain. 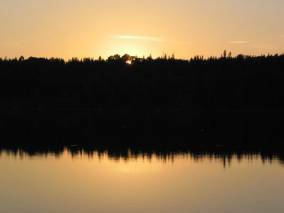 The wind lightened at dusk to a bare whisper. That is when we realized there was a gentle surge in the anchorage because of the waves crashing on an adjacent island and being deflected into our cove. So the night was not as comfortable and restful as we had hoped before our 135 nautical mile crossing to Duluth. No moose, no loons, no diving ducks, just lots of Great Crested Flycatchers along the shore. We keep trying to entice them to the boat to help us get rid of the flies. Monday, August 8, 2005. Superior, Wisconsin, Barker’s Island Marina. We docked here (sister city of Duluth, Minnesota) at 3:15 Eastern Daylight Time today after quite a ride. We left Isle Royale at 9:00 in 15-18 knots of wind from the southwest, and the sea that had built up over the past three days of strong southwest winds. Pilgrim handled the waves very nicely (much better that Swan Queen, who used to slam down hard on 4-6 foot waves). 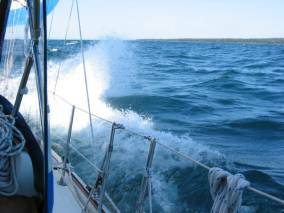 We sailed to the Minnesota shoreline (about 20 miles), and then the wind lightened, but the waves continued. We did some motor-tacking with the mainsail up and were making reasonable time, but not enjoying motoring. We continued on this way, entertaining ourselves with reading, needlepoint, and killing flies (4 or 5 different varieties kept us busy.) Some of the flies seemed to love to perch on their dead cousins’ bodies which made the sport less challenging than usual. Around 7:00 PM there was a severe thunderstorm watch declared for the Wisconsin shore of Lake Superior. 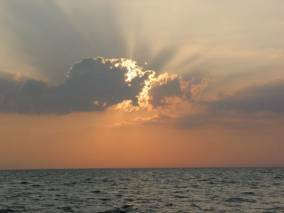 There was a huge thunderhead hovering over the shoreline in the distance. At 9:00 PM we began our two hour watches. When Brian started his watch, at midnight, the wind had picked up to about 10 knots from the northeast, directly behind us. 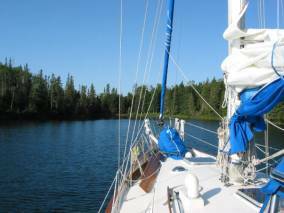 We decided to sail with our mizzen and Genoa, since the main would have blanketed the Genoa, and sailed at a slow 3-4 knots until 4:00 when the wind died again, and the motor was back on. We continued with our dull and boring motor trip until 11:30 when we were 3 miles from the lift bridge at Duluth. Suddenly, the wind switched around to Southwest again and in 15 minutes when slamming us with 17-20 knot winds and kicking up quite a sea. At noon we were just two nautical miles from the bridge, but the wind was now 20 – 28 knots, gusting to 32, and the seas were suddenly 4 feet high. Our progress slowed to a crawl. To make matters interesting, a freighter was coming out of the bridge and we were close to the shipping lanes and unable to maneuver easily. We were so relieved when the freighter’s bow was pointing to the stern of our boat. Progress through the wind and waves was so slow that it was not until 2:15 that we went through the lift bridge (quite an impressive bridge … takes it just 55 seconds to lift high enough to allow freighters and sailboats with tall masts through). The current and chop along with the wind made it slow and difficult getting through the breakwall and channel. Once through, we had to figure out which marina had room and could clear us through US customs. Neither marina answered our VHF calls. In desperation, I called the Barker’s Island Inn (next to the marina) because their number was in the GLCC logbook and they gave me the number for the marina. They had space for us and found out how we could clear through customs, so we headed the 1.5 nautical miles through the busy Duluth port to the Superior end. We had been assigned a dock, but it was only 25 feet long! After a bit of dock juggling we ended up on a fifty foot dock for the night … to be reassigned in the morning. It is so very hot and humid. It there were no wind, it would be unbearable. We put putting up our awning and left all ports and hatches open. At 2 AM a massive lightening storm hit … so it was up and out to put on our extra lightening protection and close most of the open hatches/[ports … At 5 AM the storm hit … up again to close the rest of the hatches and to check wind speed. After a half hour of 22-25 knot winds (abeam) and heavy rain the conditions lightened enough for sleep.